If names of places like Burney, Chester, Graeagle, Maybe, and Quincy don't sound like they belong in the Golden State, you now know more about Northeastern California than you did ten seconds ago! 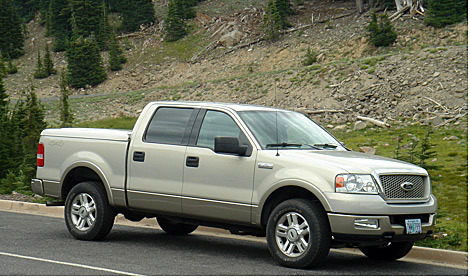 We've been planning this road trip for some time, with our map marked and hotel reservations confirmed, and are eagerly awaiting delivery of our 2004 Ford F-150 Lariat, which is being repainted to repair vandalism damage. 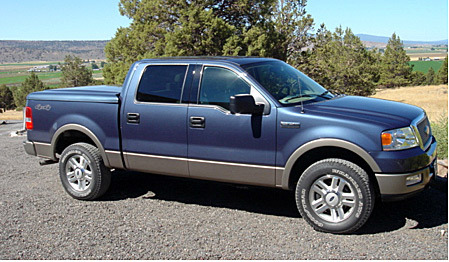 The color is being changed from “Medium Wedgewood Blue” to a Ford F-150 color from 2006, an exotic, rich “Smokestone” by Ken's Body and Paint of Klamath Falls. Ted decided to give himself a birthday present with the new look rather than having it patched up to match the old color. Ken's said it would take three and a half weeks, and as the day grows nearer, Ted makes phone calls for a progress report. "It will be ready on time", Ken's assures every time. Today, when our confirmed hotel itinerary is scheduled to start, the Lariat is ready at last. It looks brand new! The entire staff of Kens' is out washing and polishing it up with well-earned pride. Except for one young employee, who says, "How come he didn't just buy a new truck?" The boss replies, "Because this only has 41,000 miles on it and trading it in for a 2014 model would cost him nearly $30,000." The gleaming new paint job is amazing. Depending upon the light, it looks like metallic gold, or a gleaming pearl gray, or a warm beige. We depart with almost-new-truck pride. 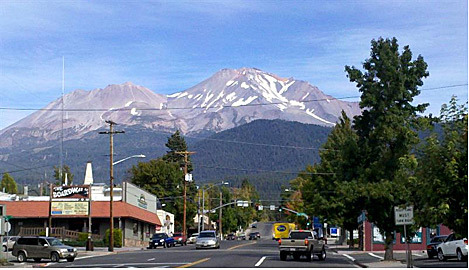 Traveling south on US 97 through forested country into California, we stop at Lily's, our favorite cafe in Mount Shasta City. Lunch on their patio, with the 14,000 foot volcano towering overhead, is a truly awesome experience. 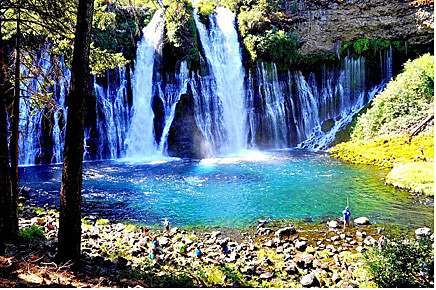 Turning southeast on US 89, we anticipate a return visit to McArthur–Burney Falls Memorial State Park with its spring-fed multiple falls, but the mercury has risen to 97 degrees, and the thought of walking to the overview through this heat is daunting. The rustic Shasta Pines Motel in nearby Burney, CA, is well air conditioned, and the oversize king suite provides a welcome oasis with all the amenities for only $106.00. Burney is definitely off the beaten tourist track, even though it is the gateway to the North Entrance of Lassen Volcanic National Park. Continuing on Highway 89, we realize - again - that those who say the recession is over have not visited the small rural towns in the US. 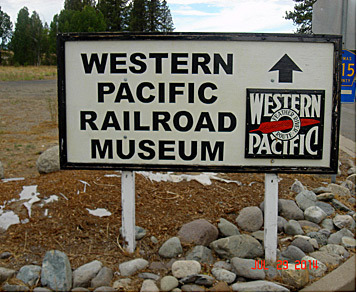 As confirmed back roads travelers, we have seen, sadly, hard-times towns in all the western states, with retail buildings for sale, as well as closed service stations, motels, and restaurants. 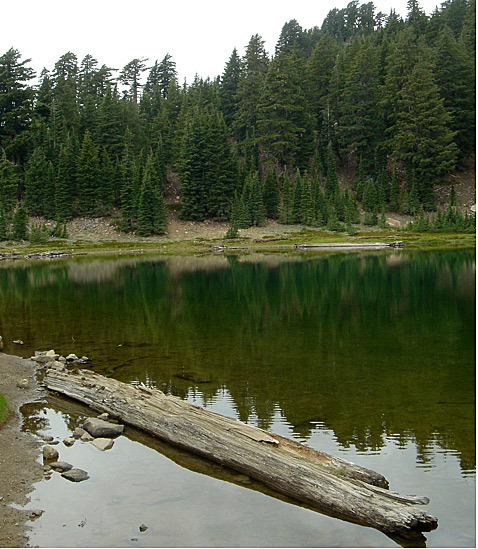 Lassen National Park displays the unexpected scenery of other inactive volcanoes surrounding massive Mount Lassen. The latter cannot be considered dormant due to its tradition of erupting every 50 or 100 years, often without warning. The big mountain, usually wearing a mantle of snow this time of year, during our visit has only a small dusting near the summit. 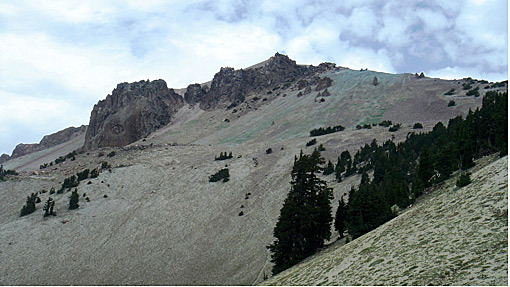 The elevation at the Mount Lassen Trailhead is 8,511 feet. Several vehicles in the parking area are an indication that some hardy souls are going for the 2.5 mile trail to the 10,463 foot summit. 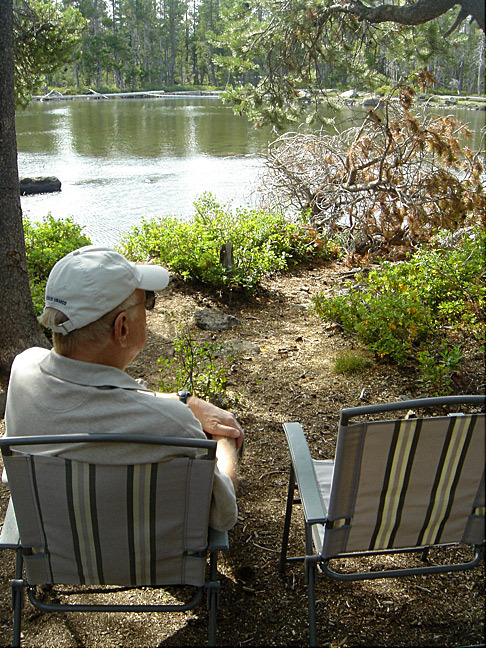 Looking for a picnic lunch spot, we pass Lake Helen, with its crowded parking lot and occupied tables. Further along lies beautiful Emerald Lake. There is a wide shoulder with plenty of room to park. A few steps down are two flat granite rocks overlooking the aptly-named green lake, so we enjoy lunch there with a private view. Further down the road, a cloud of steam drifts upwards. 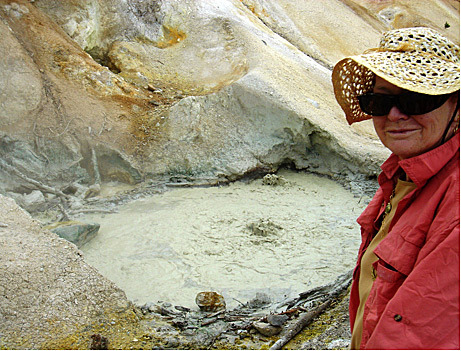 A parking lot allows easy access to within a few feet of "The Sulfur Works", a boiling, bubbling, leaden-colored mud pot, wafting odors of rotten eggs. Once a private resort with a bath house built over the steam vents, it was owned by an entrepreneur who processed the mud, distilling "Healing Substances" which he sold at a drugstore in nearby Red Bluff, CA. Stopping for a soft-drink at a store this afternoon, we notice that hunting magazines and fishing tackle are on prominent display. Anticipating our stay at the Bidwell House B & B in Chester, we pull up to an early-20th-century building with a wide porch, complete with rocking chairs and an old fashioned porch swing. Surrounded by exquisite landscaping, it has a beautifully appointed dining area set for breakfast the next morning. At check in, the lobby temperature is an uncomfortable 87 degrees. "I hope your rooms are air conditioned?" Ted asks with concern. "No. Nobody around here has air conditioning, nobody expects it. Our average temperature is 53 degrees." "If we cancel now, are you going to charge us for the room?" "and you come to the mountains for our cool mountain air!" "Since it is nearly 90 degrees in here right now, it is too hot to sleep," Sylvia points out. Meanwhile, Ted calls the nearby Best Western Rose Quartz Inn and confirms a room with air conditioning. The Bidwell House charges our credit card $158.00, the price of the Hummingbird Suite, but it is worth it not to spend a sleepless night here. A bonus at the cool Best Western is a marvelous video shown in the lobby. Produced by the National Park Service, it explains the four other peaks near Lassen and shows aerial shots of them. Historic photos of one of the volcano's eruptions are shown. It also includes a visit to Bumpass Hell, a barren area of boiling ponds and plopping mud, which we missed because of the long, hot, muggy walk. It's a treat to see what it is like without the discomfort! One of the hotel managers tells of the driest winter on record. "There was zero snow!" 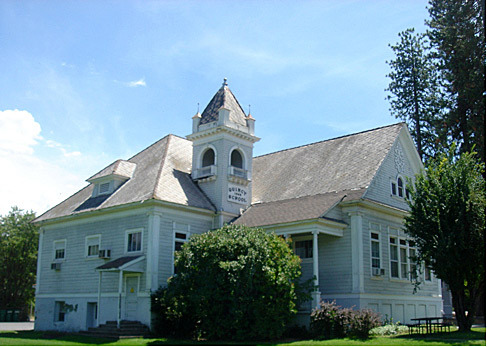 Leaving Chester, with its several closed businesses, Lake Almanor appears with water about six feet below the shoreline. The road passes many lakefront homes. Dozens of them are for sale. 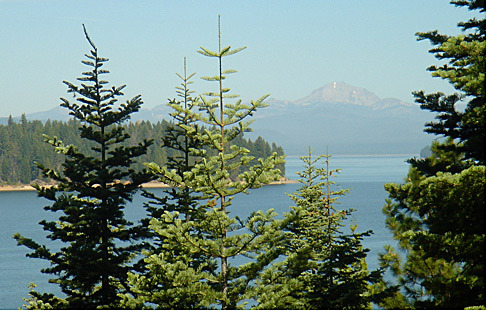 Lake Almanor with Mt Lassen in the distance. Antique but quaintly restored downtown Greenville features a pioneer-era mural. Breakfast at Anne's Cafe here features delicious cinnamon raisin bread. Noting that none of the customers are using computers, I ask, "Do you have Wi-Fi here?." "Does anyplace in town have it?" "Not really, except for a few private homes, and they are all password protected." The highway is surrounded by high mountains on the other side of a meadow, and reaches the amazing Feather River Canyon. Green even in the current draught, the bottom of the canyon embraces the dehydrated river, now reduced to a creek. Criss-crossed by high railroad bridges that zig zag from either side of the canyon, the scene is far too massive a scale to fit into a photograph. Graeagle is a community hoping to attract new residents with country property developments, and it also offers vacation rentals. 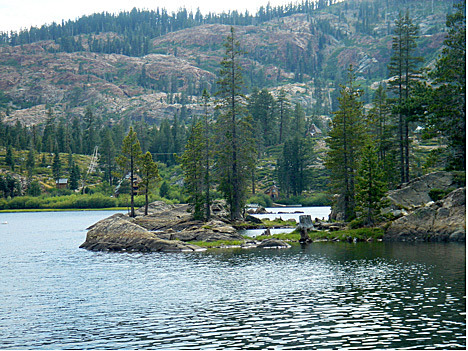 It is a short, but very steep, drive south into the high country to reach the Sierra Lakes Basin. We turn off the highway at Goose Lake's dirt road. The Lariat bucks and rolls over the large rocks imbedded in the dusty path, and comes to rest on one that it cannot go over. There are only two other vehicles in this day-camping area. A huge goose with a green neck is foraging at the water's edge. A spot with access to the lake shore becomes our picnic site. The little lake is mesmerizing as breezes ruffle the water, surrounded by a variety of healthy evergreens that make a comforting soughing sound. "Let's drive on up to see what the other lakes look like," Ted suggests. "This one is perfect. I can't imagine a nicer one," I say. "You won't know until you get there, and the next one is only four miles up the road." Ted heads back towards the highway, aiming for a path between several good sized imbedded boulders. Sylvia suggests an alternate, smoother, way between two trees. Neither of us notices the sharply protruding, low tree stump on the right. There's a horrible crunch. Sylvia tries to open the passenger door, but it is held closed by the stump, so we have to back out. Unbelievable! Our new paint job is less than three days old and the bottom panel of the front passenger door is dented and scraped! This damage will require a lot more than a touch up. Ted is already dreading his phone call to Ken's Body and Paint, but he bites the bullet and makes an appointment for the repairs the day we get back. Recovering from the shock, we drive south. 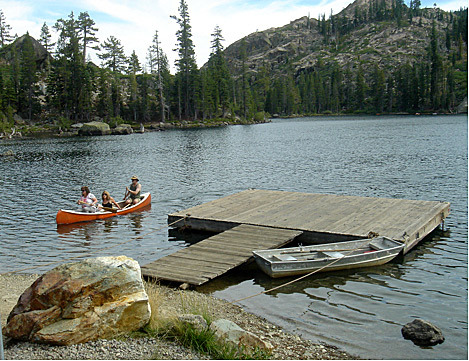 Sardine Lake is nearby, and we drive down a pot-holed road for two or three miles overlooking a beautiful granite-edged lake with small forested islands. There's a stretch where there are dozens of cars parked on each side. There is no turning back now. Recreationists with water sports equipment are speed-walking up hill preparing to leave. Cars with canoes strapped to their roofs keep coming uphill too. We must pull into a vacant space to make room for them to pass. Eventually we reach the dock where more people are loading small watercraft. We have left Northeastern California just a few miles behind and stumbled into a clash of cultures. These are urban Californians! Crowds of fast-moving, fast-talking, loud laughing and exuberantly-wired sports enthusiasts have exploded out of the valley to the southwest and claimed this lake as their own. Shouting goodbyes amid the chaos of reloading canoes, they exit in mass as if responding to a bell dismissing class. Finally we have room to turn around and head four miles back into quiet, sparsely populated Northeastern California. 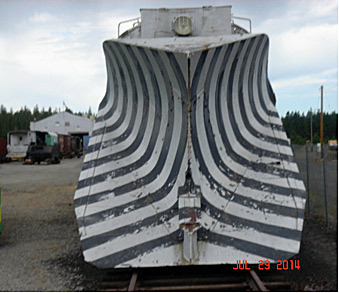 Leaving Maybe, we stop briefly at the Western Pacific Rail Museum in Portola, with its extensive collection of locomotives, freight and passenger cars, and various works-in-progress, such as this antique snow plow. In town there is a sign offering "Free Meals to Those 18 and Under". While it is wonderful that the community is addressing the problem of hungry children, this is the USA, which isn't supposed to have hungry children. 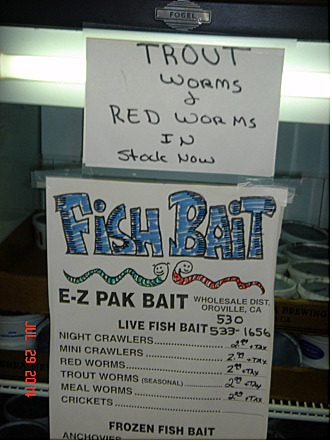 At a convenience store in town, a handwritten sign offering Live Red Trout Worms for sale convince us. We have, indeed, escaped back into low-key Northeastern California.